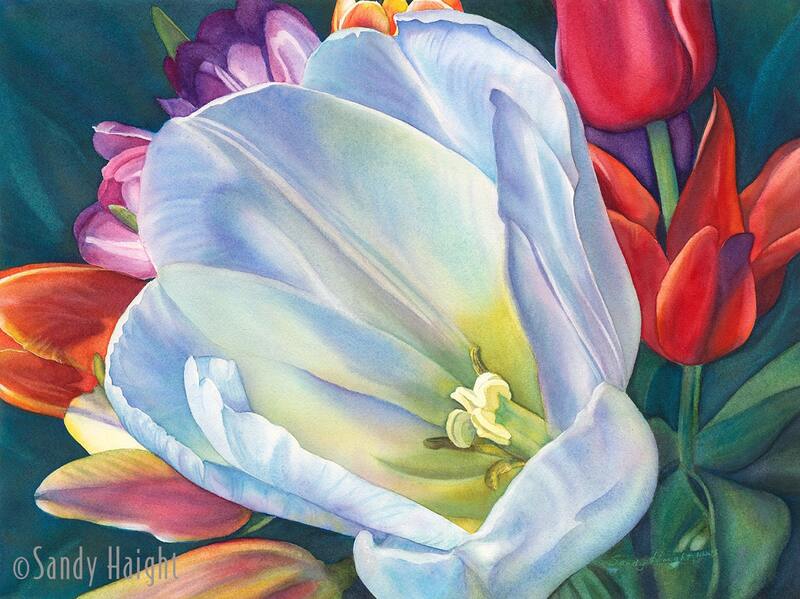 This white tulip appears full of color in its luminosity and is surrounded by a halo or warm tulips. As the poster artist for the 2016 Skagit Valley Tulip Festival I gathered lots of varieties of tulips to photograph in search of the perfect bouquet for a colorful poster. This was one option that I liked. For the past few years I've been painting flowers up so close that they envelop the viewer in their sensuality and rich color. Enlarged, they become almost abstractions from nature. This watercolor is painted on 140# Arches Cold Press paper. It is framed with a white metal 1" frame and a 3.5" white archival mat and backing with plexiglass. A Certificate of Authenticity comes with the watercolor signed by Sandy Haight. It is ready to hang for your pleasure. The size listed is the size of the frame. The image size is about 19" x 14". I've been using watercolor and ink brush line in my illustration work for nearly 20 years, but in a much more controlled and predictable way. My pictures appear on book jackets, ads, posters, logos and packaging all over the country and Canada. If you'd like to see my world of client driven projects, check out my published artwork at http://sandyhaight.com. My Watercolor Life Drawings, Sumi Figure drawings and watercolors are on my fine art web site at http://sandyhaightfineart.com and throughout this Etsy store. Teaching watercolor has recharged my interest in painting subjects that I love. Frame Size: 26" x 21.25"